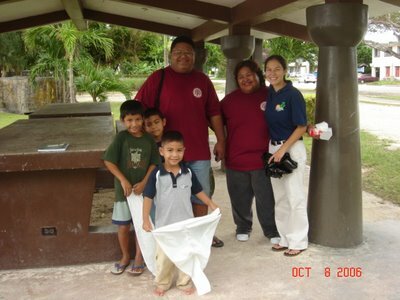 Many thanks to Litter Control Officers Ray Sablan and Michael A. Reyes, and supervolunteers Pauline Dela Cruz, William and Bobby Hunter and the kids (Brianna, Brandy, and Brissa), Glen Hunter, and Cinta and Gus Kaipat and the kids (Willie Boy, Josiah, and Jun) for being our first batch of Sunday Beach Baggers! From Wing Beach to San Antonio beach on Sunday, Oct 15, our ebullient Beach Baggers passed out trash bags and talked to diverse groups of beach barbecuers about Beautify CNMI! 's anti-litter efforts. Says Cinta, "People were attentive and friendly and some of the locals said it's about time... They were all gracious and allowed us to take up a few minutes of their time to educate them about our anti-litter education month and the zero-tolerance month coming up in November." The Beach Baggers also asked everyone to clean up their areas after their parties and to take their trash with them if public garbage bins were full. 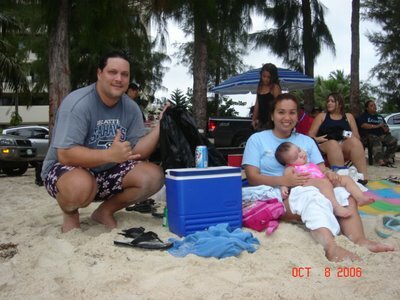 William and Bobby Hunter take a break from Beach Bagging on Aquarius Beach, with their daughter Brissa (Beautify CNMI! 's littlest volunteer, poor thing, she was wiped out). Not shown in the picture are daughters Brianna and Brandy (they were swimming). The CNMI's Litter Control law imposes a hefty $200-$500 penalty for littering. We'd rather not have to cite people, and for the month of October are focusing on anti-litter education and awareness. November, however, is Zero Tolerance Month -- and we'll accept no excuses for trashing our islands.